Click the move icon which is located between the 2 sections. The action will appear in the right-hand section, under Action steps to show: > Untitled. This action should only be used on PDFs that are missing tags. 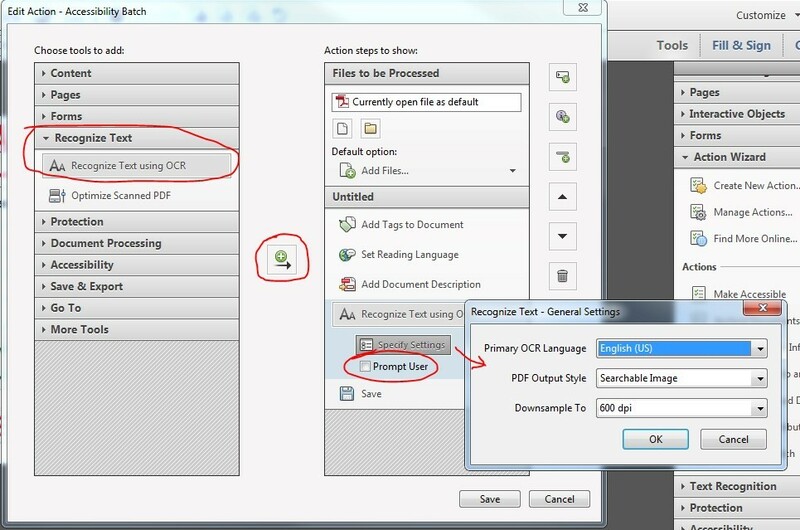 If this action is run on previously tagged PDFs it will replace those tags with a new set of tags which could be an issue if the previous tags were already in an accessible format. 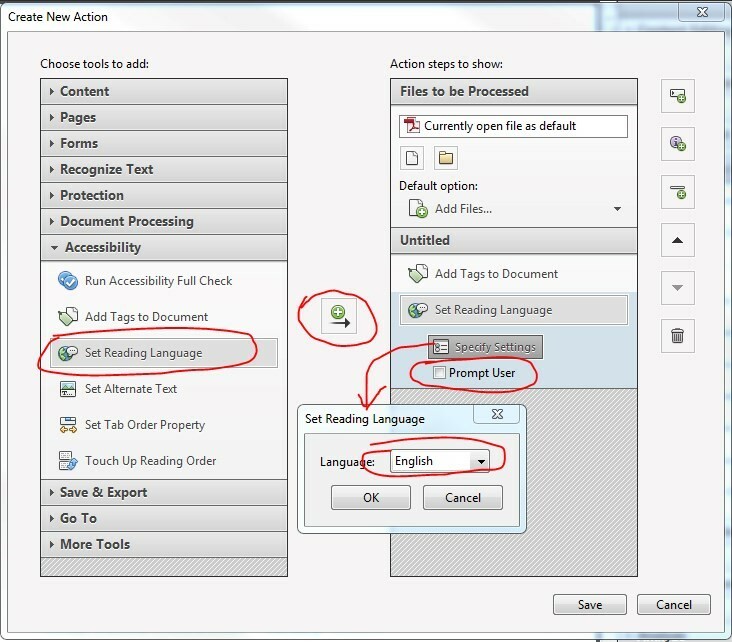 In the Set Reading Language window, make sure English is selected. 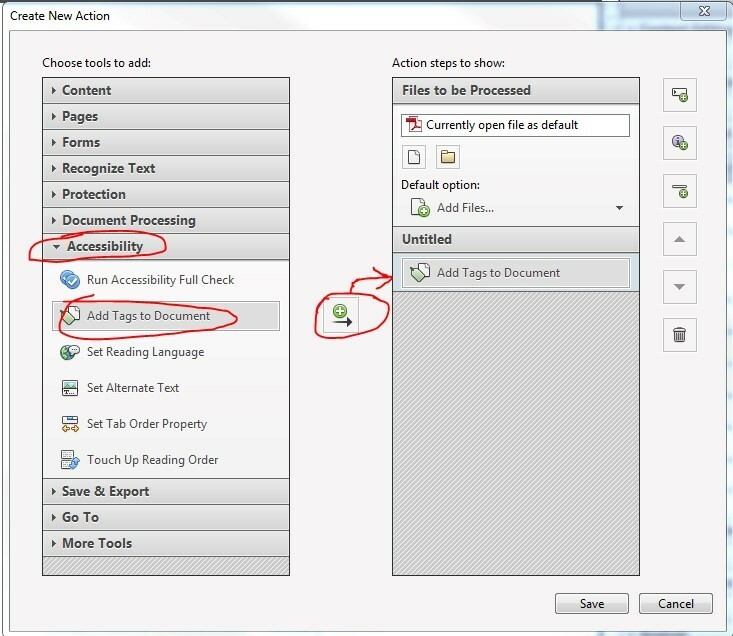 Be sure to uncheck prompt user so it will go automatically if they are all English documents. 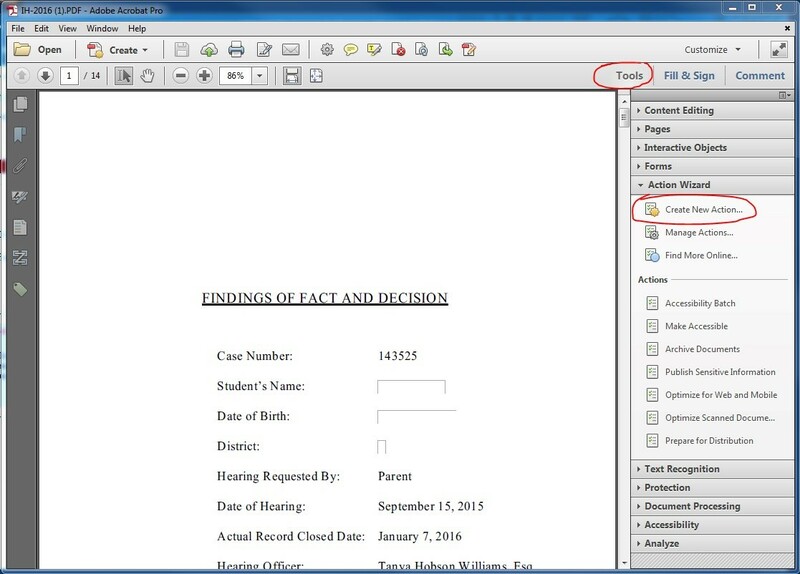 In the Create New Action window, under Choose tools to add: click Content > Add Document Description. Title and author are required for NYSED’s minimum accessibility requirements. Subject and keywords are also recommended. Important: after running the batch wizard, the document title and possibly subject and keywords will still need to be manually updated to match what is needed for each individual document. Under Subject, de-select Leave As Is. Type in the name of your program area. For example, Special Education. Author should always be set to “New York State Education Department,” unless the document was authored by an outside individual or organization. Under Author, de-select Leave As Is. Type in New York State Education Department. Be sure to uncheck prompt user so it will go automatically. 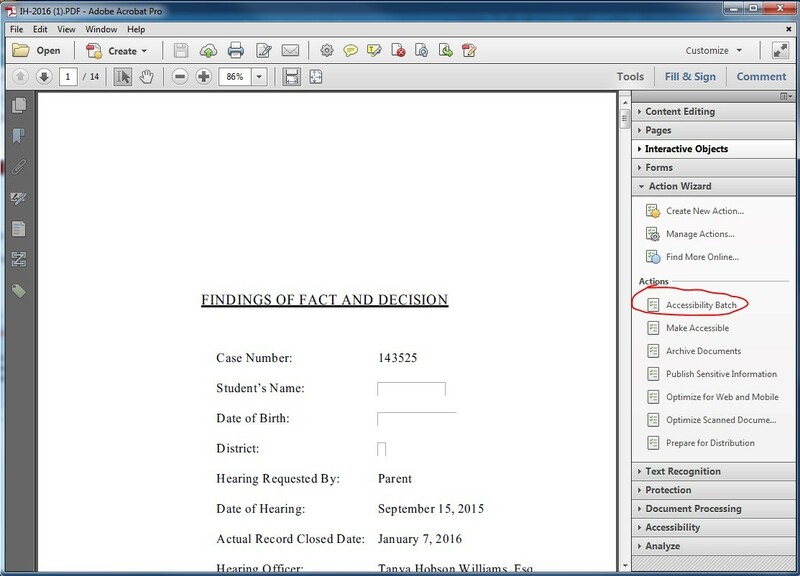 Important: if a document has even one character of text on a page then the OCR scan will skip the page. 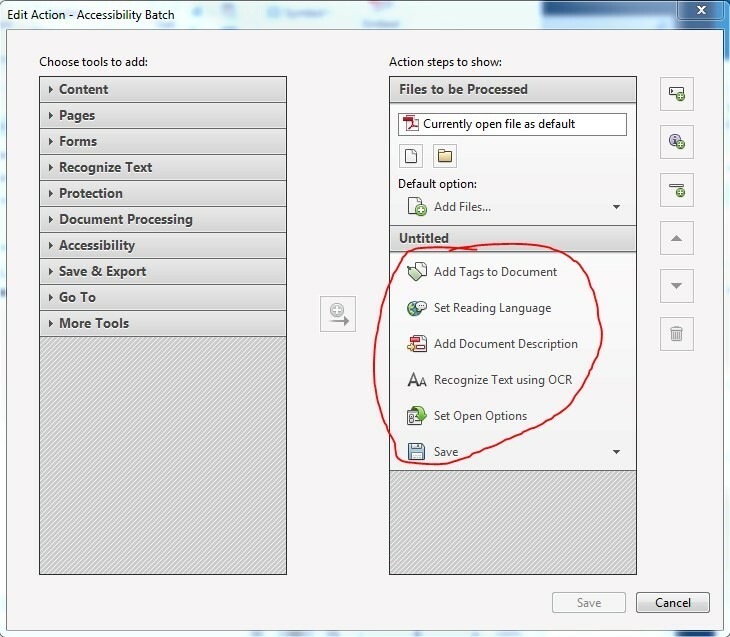 Therefore, it is important to manually review documents to ensure that all image based text has an accessible text version. 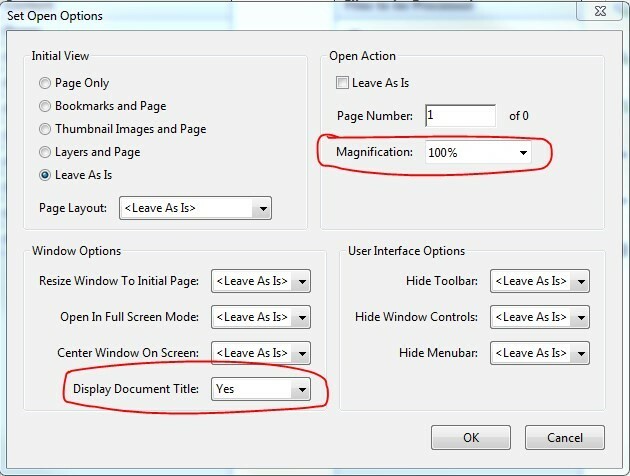 Select Yes to Display Document Title. Under Open Action select magnification = 100%. Add Save as an action so that each file we automatically save and the process will continue automatically on all files selected. Files are to be overwritten with the same name. In the Create New Action window, under Choose tools to add, click Save & Export > Save. In the Save Action window, type in an Action name. 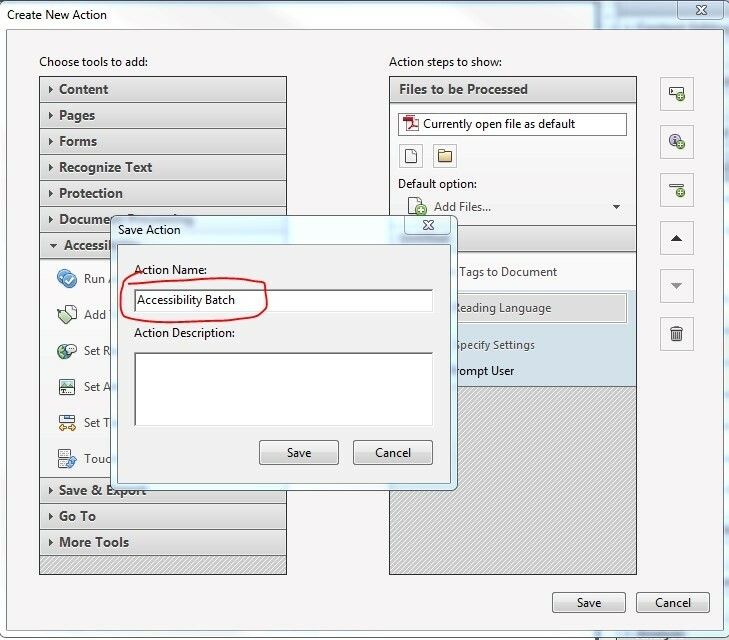 It can be “Accessibility Batch” or anything you'd like.